Mercy Molina, R.D., L.D./N., C.D.E., C.P.T. George W. Burke, III, M.D. Wendy Satin Rapaport, L.C.S.W., Psy.D. Jay S. Skyler, M.D., M.A.C.P. Maria Del Pilar Solano, M.D. A full gallery of event photos can be found here. The 35th annual Empire Ball, presented by the Real Estate Division of the Diabetes Research Institute (DRI) Foundation, took place on Wednesday, December 12th at The Grand Hyatt Hotel. The event outdid itself this year in many respects. Six iconic towers lit up the sky for the DRI in shades of radiant blue, the international color of diabetes. The ballroom was filled with 900 members and friends of the metropolitan real estate and construction community and the event raised more than $1.4 million dollars for the DRI’s cure-focused research. In its history, the Empire Ball has raised over $38 million for diabetes research. A lively cocktail reception that filled the hotel's ground floor was followed by dinner in the Empire State ballroom. During the program, Glen J. Weiss, Executive Vice President of Vornado Realty Trust, was presented with the Empire Ball’s Leadership Award. 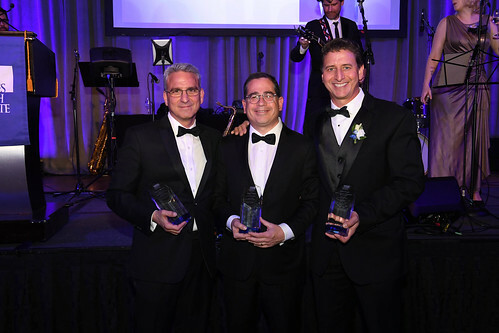 Joel M. Brenner, Vice President, Head of Global Project Management at WarnerMedia, received the Camillo Ricordi Humanitarian Award. Robert Cuzzi, President/Principal of VDA (Van Deusen & Associates), accepted the Peter L. DiCapua Distinguished Service Award. Each of the honorees was humbled by the honor, and grateful to their families, friends, colleagues, and to the DRI for their support and good wishes. Glen, Joel, and Robert took time from their busy lives to visit the DRI at the University of Miami, and each came away awed by the hard work and dedication of the doctors and scientists who are devoted to finding a cure. The emcee for the evening was the New York Yankees play-by-play announcer, Ryan Ruocco. Entertainment was provided by The Last Nites, and guests also were treated to a couple of up-tempo numbers sung by Sal Valentinetti, season 11 finalist of America’s Got Talent. The Diabetes Research Institute Foundation congratulates each of the evening’s honorees and warmly thanks the many wonderful sponsors and friends of the Empire Ball. Peter L. DiCapua*/Code Green Solutions, Inc.
Avi Itzikowitz**/ATCO Properties & Management, Inc.
John Santora/Cushman & Wakefield, Inc.
Vanguard Construction and Development Co. Inc.
John Gallin & Son, Inc.
Alliance Building Services and Icon Interiors, Inc.
Ess & Vee Acoustical & Drywall Contractors, Inc.
J.T. Magen & Company, Inc.
Be a DRI Insider - Get News!